Dec 01, 2015 Thank you for your feedback John. We have tried to contact you however none of the contact details you provided appear to work. Would you please submit more information on the Contact Us section on our main website with your contact details and a member of our team will be in touch. 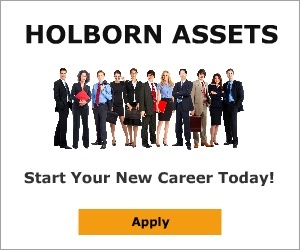 I met with an advisor form Holborn assets. I already had an advisor but he said I should have an Audit done every few years, it seemed to make sense. When we met he was really nice but made me feel really scared over the charges and the fees my current advisor was taking, I signed some paperwork as he said it was just an audit and he had to look. The next day My other advisor phoned and said my account had been transferred. I was shocked my advisor came down and explained everything to me and that they had no way of dong an Audit, they were in direct competition to them and that they would turn round and add fee's on. After a week Holborn phoned and said that the previous advisor was charging 2% per annum and that they would only charge 1% per annum. And recommended a load of fund switches. I called the providers direct, the provider confirmed my initial advisor was not charging any annual fee, that this had already been paid in advance and that there was no 2% per annum. the provider said that this was a trick being used to take clients away from other firms and start charging them a fee. It turned out the funds they wanted to switch me in were all commission paying funds away from the low charging tracker funds I was in. This all seems a little underhand. Why cant advisors just be honest. Hence to say I have gone back with my original advisor as I trust him and not these people who pretend to be friends, cast doubt and then start to charge. Preferred solution: Not to be contacted by this company again. .
Review #740546 is a subjective opinion of User740546.